Unbeaten rising bantamweight star Ketlen Vieira scored the biggest win of her career in UFC 215 prelim action, as she submitted Sara McMann in the second round at Rogers Place in Edmonton. Not surprisingly, McMann put Vieira (9-0) on the deck early and the Olympic silver medalist went to work, eventually getting the mount position, where she fired off punches. Vieira was able to get loose though, and she soon had McMann in trouble as she tried to lock a leg up. But McMann broke free just before the end of the round. As McMann (11-4) shot for a takedown in the second minute of round two, Vieira was able to land some hard close-range shots that ended that attempt. McMann recovered quickly and worked from the clinch, but it was Vieira getting the takedown with two minutes left. As the round wore down, Viera suddenly locked in an arm triangle choke, and McMann was forced to tap out at 4:16 of the second stanza. Back for her first bout since July of 2015, Kelowna’s Sarah Moras was stellar in her comeback bout, submitting No. 15-ranked bantamweight contender Ashlee Evans-Smith. Evans-Smith got an early takedown and moved easily into side control, but Moras stayed cool, and soon, she began looking for an arm. Patiently working, the former Ultimate Fighter competitor found enough room to move, and when she did, she secured the armbar that produced a tap out at 2:51 of the opening round. With the win, Moras moves to 5-3; Evans-Smith falls to 5-3. Veteran featherweight Rick Glenn made it two straight in the Octagon, as he handed Gavin Tucker his first professional defeat via unanimous decision. Looking better than ever after his first training camp with the Team Alpha Male squad in Sacramento, Glenn was a cardio machine as he pressed Tucker throughout and dominated in all aspects of the fight. In the third, Glenn took everything to another level, and he punished the gutsy Tucker throughout. Unfortunately, referee Kyle Cardinal opted not to step in, but the final result was never in doubt, as Glenn improved to 20-4-1 by scores of 30-25, 30-24 and 29-27. Nova Scotia’s Tucker falls 10-1. Missouri lightweight Alex White put together an impressive effort in spoiling the homecoming of Mitch Clarke, stopping the Edmonton product in the second round. White (12-3) kept the fight standing in the opening round, but Clarke (11-5) wasn’t too bothered, as he battled White on even terms. But in the second, White took over, first with several hard elbows in the clinch. Then a knee to the body dropped Clarke, and while the bloodied hometown favorite stayed in the fight, White was not to be denied, and his accurate punches produced two more knockdowns before referee Jerin Valel intervened at 4:36 of round two. Following the bout, the 31-year-old Clarke, who turned pro in 2007, retired from the sport. 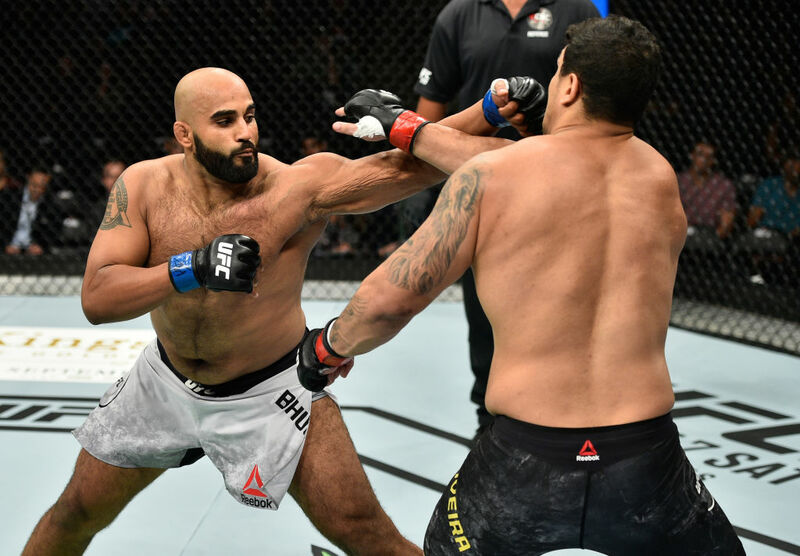 2012 Canadian Olympic team wrestler Arjan Singh Bhullar made a successful UFC debut, as he won a close, but unanimous decision over Brazil’s Luis Henrique in heavyweight action. Bhullar pressured Henrique throughout the first five minutes, landing a right hand that was the best punch of the round. Henrique was patient, though, and he avoided a takedown from the Olympic wrestler, which was a moral victory of sorts. Two minutes into the second round, Bhullar’s right hand struck again, this time producing a knockdown. Henrique got to his feet, but Bhullar slammed him to the mat and began firing off ground strikes on the bloodied Brazilian, capping off a big round. Looking to turn things around in the final frame, Henrique went on the offensive in the third, and he landed several hard kicks and did good work in the clinch, allowing him to take the round, but not the fight, which went to Bhullar by three scores of 29-28. With the win, Bhullar moves to 7-0; Henrique falls to 10-4 with 1 NC. Canada’s own Kajan Johnson got the Edmonton fans into the card immediately, as the lightweight veteran returned from a nearly two-year layoff to extend his winning streak to three with a third-round knockout of Adriano Martins. There was little significant action in the first round until the closing seconds, when a left hand by Martins put Johnson on the deck. A follow-up guillotine choke attempt fell short, but the knockdown by Martins clearly earned him the frame. 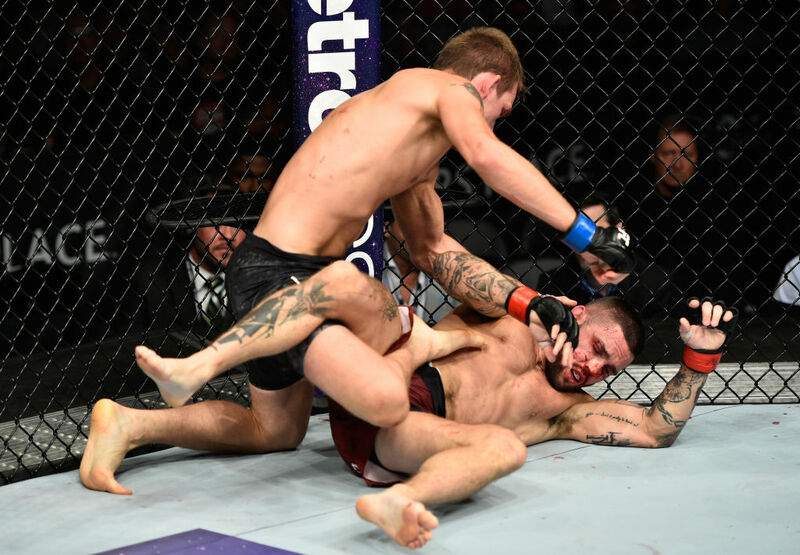 Johnson continued to focus on movement around the cage in the second round as Martins stalked, and while this didn’t produce the most compelling fight, the Canadian did potshot his foe enough to perhaps even the score heading into the final round. But Johnson took the judges out of the equation in the third stanza, as a right hand to the side of the head put Martins down and out, with referee John McCarthy calling the bout off at :49 of the round. With the win, Johnson moves to 22-12-1; Martins falls to 28-9.